Sowmya requested the recipe for the "noodle" stir fry I mentioned in my last post- so here it is as promised. I swapped out noodles for broccoli slaw to lower the carb content of this meal while making it vegetable-heavy. This does not have to be an all or nothing swap, by the way. Even if some cooked wheat/rice/other noodles were added to this dish, it would still have a lot more vegetables than standard vegetables noodles which tend to be heavy on noodles with only a few bits of vegetables here and there. Do what works for you! Broccoli slaw is a shredded mixture of broccoli stalks, sometimes with some carrots and red cabbage included. It is sold in packages in the produce section of American supermarkets. Heat 1 tbsp. oil in a wide pan on medium heat. Drain and pat dry 1 package of extra-firm tofu. Cut into bite-sized cubes. Pan fry the tofu until lightly browned. When the tofu is almost ready, sprinkle it with 2 tbsp. nutritional yeast and a bit of soy sauce. Stir fry for a minute more, then remove tofu into a plate and set aside. In the same pan, heat 1/2 tbsp. oil. Pour in a 10 oz package of broccoli slaw. Stir fry for a couple of minutes. Add 2 tsp. ginger garlic paste, soy sauce, hoisin sauce, sriracha sauce, a drizzle of maple syrup, all to taste. Add a handful of crushed peanuts or a couple of tablespoons of peanut butter. Stir fry for a couple more minutes. Garnish with minced cilantro or green onions. Toss with the tofu and serve. I love store bought broccoli slaw, I think it is worth every penny. Love the idea of using that as the 'noodles'. 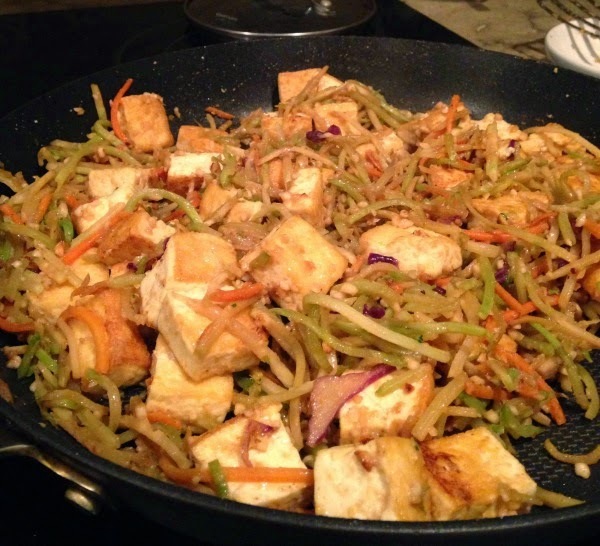 Stir fry sounds very flavorful with the addition of nutritional yeast, hoisin and maple syrup. I've to try this soon. Pavani- I think this is the only packaged thing I buy in the produce department (other than tubs of mushrooms) and you're right, it is worth it. Nupur, that's the way I love to cook. Lots of seasoning, lots of vegetables, looks YUMMY! Bobbi- that's pretty much my mantra- lots of flavor and lots of vegetables! Thanks for the recipe- looks so good and healthy! Quick question on the addition of nutritional yeast - is it for additional flavor ? Or more for nutritional purposes? It's not a staple in my pantry and wondering where else u use it? I add the nutritional yeast for flavor- it has a savory, umami flavor and it takes the place of seasoning packets/bouillon. As a bonus, it is very nutritious too, rich in B vitamins. It has become a pantry staple for me in the last year or two. I use it in stir-fries and soups and gravy. Adds a wonderful savory flavor. Thanks for the info Nupur! I will definitely add it to my pantry and looking fwd to start using it! Nupur, Thank you for posting the recipe. The addition of nutritional yeast is new to me. I eat it sprinkled over popcorn, but have never cooked with it. Another question: what do you do about snacks? Crunchy mamra, chakli and murukku type snacks... I could go on. As long as it is crunchy and salty, I am not picky. Rainee- I am very fond of crunchy and salty snacks too! In fact, given that I eat mostly simple, homemade food, the constant snacking has been my biggest problem. These days I am delighted to find that eating carb-controlled meals has dramatically reduced my cravings for snacks. But I do keep nuts and hummus/carrot sticks around for snacks. When that kind of craving strikes me, I simply fire-roast an urad dal papad and enjoy it...slowly...taking tiny bites and focusing on the crunchy and salty part. One papad takes care of the craving. I have seen recipes where you can toss tinned garbanzo beans in spices and slow roast them in the oven until crisp for a healthy snack but I have not tried it yet simply because it takes time and I need something instant when the craving strikes occasionally. I am going to try making a savory version of granola (like chiwda) someday to see if it works. Where to you buy nutritional yeast? I buy it in the bulk section of a natural-foods grocery. This must be so yummy! Almost like pad-thai :) I don't buy packaged veggies but the next time I buy cauliflower and broccoli, I'll reserve the stems and try to make my own slaw mix. Do you think that it is do-able? What can I used instead of nutritional yeast? It is seriously yummy, I promise you :) And yes, you could switch up the sauces and make all sorts of Asian noodle dishes. You could definitely make slaw mix by using the shredder disk on a food processor. My problem is that I usually find broccoli crowns in the grocery store so there are no stalks to begin with. You can skip the nutritional yeast. Taste and add more flavor with soy sauce/hoisin sauce/mushroom stock/miso, or whatever umami ingredients you keep around. Thank you for the recipe. This looks delicious Nupur. I love and very frequently crave chinese/thai food and will definitely try this out. Awesome recipe! I have cut down carbs considerably in the last 3 years since my younger one was born. Another substitue is spagetti squash. you can steam/microwave or bake it and then it comes ot as spagetti.. i use pasta sauce with this. Ill try the broccoli slaw and let u know how it goes. I've been using spaghetti squash a lot and I really enjoy it, Anu!